NYE: from December 27th to January 11th 2019 – see pricing below*. The Andes will seduce you with a triumph of colors and lunar landscapes. Every Rider dreams of traveling destinations never before seen or imagined, especially if one of the most beautiful routes and famous of the world is crossed: the Ruta 40 (Route 40). All of this while taking advantage of the service of a professional and punctual guide capable of making an adventure of this magnitude and, above all, safe. In addition to giving our riders the best of these 3730 kilometers directly to the Atacama Desert, we will take each group to perform unique local tasting experiences to savor the more important local and regional wines. A true and authentic “Italian taste” that will leave an indelible mark in each of the riders who choose to venture on a motorcycle across the Andes and el Paso Jama. We will begin from Osorno, Chile and we will ascend towards the north to arrive at our first hours at the Region of the Seven Lakes and volcanoes, we will stay in the lively town of Pucón, which lies at the foot of the Villarrica Lake and of the homonymous National Reserve (Reserva Nacional) that surrounds the volcano of the same name. We will then cross the border with Argentina the next morning and entertain ourselves by passing through a ground phase of easy travel and in a few hours we will get closer to the mythical Ruta 40 (Route 40). We will climb the backbone of South America for two days by touching the city of Zapala and Chos Malal. Finally we will arrive at Mendoza and we will enjoy the local culture, tasting the best meats, the most traditional dishes and tasting the most coveted wines of this magical and full of entertainment region. The nightlife of Mendoza will delight us and we will take advantage of our first rest day to explore the environment by visiting places of interest and always making the tastings of local cuisine abundant. We ascend through Los Andes through the pre-cordillera range with its 365 curves of the famous phase of Los Caracoles (The Snails). Fascinating is the aridity of this space in the heights, we will visit the salt flats of Barreal and we will dive into this picturesque village where we will spend the night at an authentic Argentine hacienda. We will follow the line of the mountain to the north sensing important chromatic variations in the heights of the hills that circle and defy the curves that are lost after the slopes of these arid and sterile mountains within the majestic Canyon of Alcázar, to uninhabited tracts of land. The architecture of Villa Union will be one of the first signs of our impending entry to the Rioja region, fascinating and mysterious, as its wilderness. We will discover the provincial reality of this region tasting its culinary specialties at Campanas, where will stay, the same as in Cafayate where we sleep at an authentic Argentine farmhouse from 1740 which has been completely refurbished. Immediately after our next departure we will be surrounded by the Humahuaca Valley Canyon, famous for its geological and historical importance and for its international recognition from UNESCO as World Heritage Site and a biosphere reserve since 2003. We are in the heart of this polychromatic experience and we find ourselves in the region of Jujuy where the city of Salta and Jujuy reside, which we will cross through suggestive and eye-catching paved trails, admiring the montaña de los Siete Colores (mountain of the Seven Colors) a little before arriving at our hotel in Purmamarca, at the foot of the famous Paso Jama. We have traveled several thousand miles away, but what we have been preparing to see and feel is the best of this experience. The Paso Jama begins to be recognized by presenting a wonderful series of turns in ascent through which we will dive into on motorcycle to take pictures in perspective and we will try a little of what the Peruvian and Bolivian Plateau is. 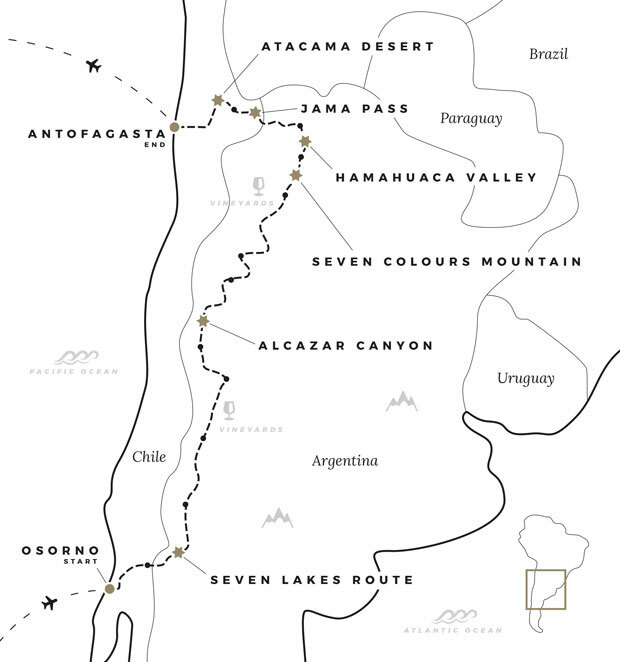 We will then cross the border and a vertiginous ascent and descent of curves, we will enter from the top to the Atacama Desert and the famous and picturesque San Pedro de Atacama . We will organize our second day of rest at the interior of this important desert, famous throughout the world for being the most arid of the planet and rich in places of interest, among which is the Valle de la Luna (Valley of the Moon), the Valle de la Muerte (Valley of Death), the Gayser of Tatio, the Puritama Hot Springs and the Ojos del Salado. With so many things to see and discover, we will not let our riders miss out on the opportunity to live guided tours in many of these places of interest. 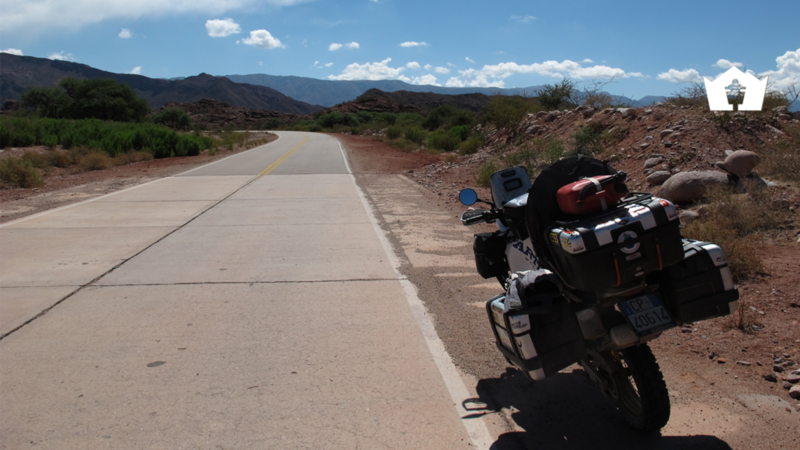 The last night in the desert will be just the excuse to celebrate the achievement of this Andean Motorcycle Adventure. During the last day of the tour we will prepare ourselves to enter in Antofagasta after a journey of 4 hours in the desert and then after a well-deserved night of rest we will make our return in Santiago and then, subsequently, home. Pricing for a 15 days guided group, operated from September to June. Prices are in USD VAT included, rider based on twin room and for a minimum of 8 bikes. Fully customizable for private groups or self-guided tours. Pricing for a 15 days guided group, operated during Easter (April) and New Year’s Eve (Dec 27th – Jan 11th). Pricing for a 16 days guided group, operated from April to end of October (also during Easter). Special discount for your next tour/hire with us. All items not listed in ‘included services’. Inclusions can be fully customized for private groups or self-guided tours.